Veterans Day 2013 is less then a month away and it is time to acknowledge the companies that will take the time to appreciate our deserving US Veterans. Many of these Restaurants and Businesses are Franchises and Participation may vary. Be sure to call ahead to insure they are participating. Cheeseburger in Paradise (meal) Veterans and military personnel are honored with a free All American Burger and fries on Monday, November 11, 2013 with the purchase of a beverage. Chili's Bar & Grill (meal) on Monday, November 11th veterans and active-duty military receive a free meal from a special Veterans Day menu with proof of military service. Friendly's (meal) All active military and veterans will receive a free Big Two Do Breakfast and coffee on Monday, November 11, 2013. Golden Corral (meal) on Monday November 11th from 4 PM to 9 PM Veterans receive a free Veterans Day buffet and beverage. Any veteran who has served in the United States military or is a current active duty service member is eligible. All Golden Corral locations will be participating. No identification is required to get your free Veterans day meal. Hooters (meal) On Monday, November 11, 2013, veterans and active duty military personnel receive a free meal with some restrictions. Krispy Kreme (meal) is offering a free breakfast at Krispy Kreme that includes a doughnut and a small coffee. Little Caesars (meal) is offering free Crazy Bread on 11/11/13 to honor our veterans. Details coming soon! Max & Erma’s (meal) Free Cheeseburger, Soup or Salad and Dessert on Monday, November 11th. McCormick & Schmicks (meal) Join them on Sunday, November 10, 2013 as they pay tribute to our veterans with a complimentary entrée from a special menu. Menchies (meal) will be giving free 6 oz. cups of frozen yogurt to veterans and active duty military all day on Veterans Day with proof of service. Olive Garden (meal) They have confirmed they are doing /something/ but no details yet. Will update when we find out more. In addition, Olive Garden is honoring military families all month long with 10%. Restrictions apply so be sure to click on the link to learn more. Outback Steakhouse (meal) Veterans & Active Duty will receive a free Bloomin' Onion and beverage on November 11, 2013. Outback Steakhouse is also giving out a military discount of 10% off the total check November 12 to December 31, 2013. Red Robin (meal) has nothing 'official' yet but they have something up their sleeve. Stay tuned! Shoney's will be having a Veterans Day free meal on November 11, 2013 that consists of a free All-American Burger for veterans and active duty military. Starbucks will not only be serving Veterans, Active Duty and Spouses a cup of free coffee on Veterans Day but they are also focusing their hiring strategy to hiring Veterans and Spouses all year long. Tony Roma's (meal) will be honoring our veterans on Veterans Day. Stay tuned for details. 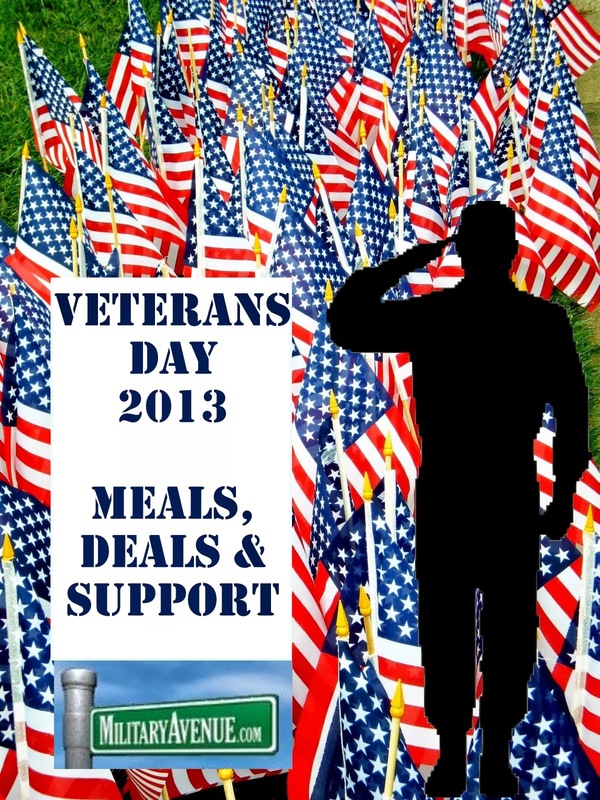 TravelCenters of America (meal) All CDL drivers who are also military veterans eat FREE in participating full service restaurants on Veterans Day, November 11, 2013. Up to $15 value. B&B for Vets (deal) Participating Bed and Breakfasts are offering a complimentary room for a Veteran and guest on Sunday (November 10th) or Monday (November 11th). Learn more at the Better Way to Stay website. Bed Bath & Beyond (deal) is offering 20% off your entire purchase for Veterans Day (November 9, 10, & 11th, 2013) if you are Active Duty, dependents, or veterans Offer is in-store only and you MUST provide proof of eligibility. JCPenney's (deal) is offering 20% to all veterans, active-duty and family members with a military-ID as a way of 'Thanks' from November 6 through 11. Click on link to print coupon and read exclusions. National Parks across the country are waiving fees for all visitors, November 9-11. Time to plan a weekend to enjoy nature and all the freedoms our veterans have worked for us to keep. Toys R' Us & Babies 'R Us (deal) from November 10 though November 16th are offering 20% off one item with proof of military-service and coupon. Grace for Vets (deal) is organizing free car washes across the nation for all Veterans on Veterans Day. Head to their website to find a participating location near you. National Military Discounts all year long: These companies offer a Military Discount all year long. Be sure to check them out. Long Beach, CA, The Aquarium of the Pacific honors veterans, military personnel, police officers, and firefighters. These men and women are invited to enjoy the Aquarium with free admission on Veterans Day, 2013. Albuquerque, NM, Tucanos Brazilian Grill is offering a free meal to Veterans, Retired and Active Duty Military. Colonial Williamsburg, VA, Honoring Service to America, Active duty military, reservists, retirees, veterans, and their dependents receive free Colonial Williamsburg admission for the entire Veterans Day weekend—November 8–11, 2013. Explore the Revolutionary City, hear the stirring cadences of the Fifes and Drums, join in the patriotic events, and browse the Art Museums of Colonial Williamsburg. Local Military Discounts all year long: Find your military instillations and browse the list of companies that support our troops 365 days of the year. St Louis, MO, Join Target and The Mission Continues "as we unite, once again, to serve in the community this Veterans Day. Volunteers will gather at Walnut Grove Elementary School to revive outdoor landscaping, refresh the indoor and outdoor paint, and do some constructing of seating and shelving." Dallas Ft-Worth, TX, "Red Cross DFW Invites Donors to Give Blood in Honor of Military" Veterans Day is Nov. 11, and the American Red Cross invites eligible donors to schedule an appointment to give blood in November in honor of those who have served the country in the U.S. armed forces." Visit ﻿﻿101 Ways to Thank a Veteran to find out what you can do for a veterans this Veterans Day and every day of the year.